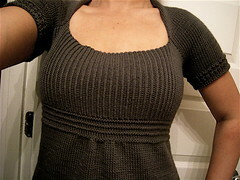 Finished: A top called "Attitude"
Pattern: My own design based on Tubey! I named the top: Attitude. My, my... It sure has been a journey with this one! Because of all the attitude this top gave me, I accordingly named her "Attitude". Readers who have been frequenting this blog for a while, might remember it all started lasted november when I had an idea for a top design. My design was inspired by Cassie Rovitti's Tubey Sweater as seen on Knitty.com. After I drew out the design, I started swatching, casted on and soon enough I was well on my way. This top gave me some serious attitude. The first bump in the road was when I increased waaaay too many stitches for gathering! Ooff, all the ripping back that I had to do... numerous times! Looks good, huh? I am happy! I am so glad to finalize this project... It took me a long time to finish it! If you want to read all entries on this project click here. Yay, I am so proud of myself! Thanks for sticking with me on this one everybody... and thanks you so much for your tips and encouraging words. I really appreciate that, you all kept me going. Submitted by Anonymous on Tue, 03/23/2010 - 17:06. Submitted by Nancy Ricci on Fri, 07/25/2008 - 21:24. Hmmm... I don't remember from the top of my head. Let me get back to you on this one. If I can find my notes somewhere in my pile of papers, I will let you know what stitch I used. I think I just made a simple 1X1 ribbing. Yeah, that is what it must be. Simply 1X1 ribbing. Submitted by ms.clueless on Fri, 07/25/2008 - 20:22.
this top is awesome!!! can you tell me what stitches you used for the start of the sleeves!!! thank you!!! Submitted by jenlkearney on Wed, 06/11/2008 - 21:41. This is completely fantastic! It looks really comfy and flattering yet totally elegant. Submitted by renna on Wed, 06/11/2008 - 03:22. You are such a talented designer, Nancy! I'm so happy for you that you conquered it. It's just beautiful, and it looks great on you. Submitted by jenni on Tue, 06/10/2008 - 15:43. Submitted by edith67 on Mon, 06/09/2008 - 07:13. EEEEEEIIIIIIIINNNNNNDDDDEELLijk af. Maar het resultaat mag er wezen. Mooi en simpel. leuk patroontje. Submitted by jennifer on Sun, 06/08/2008 - 14:13. It's lovely! Congratulations on a successful project! Submitted by Anonymous on Sun, 06/08/2008 - 13:08. Submitted by vanessa (not verified) on Sun, 06/08/2008 - 12:25.
wonderful! it looks great! good for you for sticking with it and mastering your own pattern. it's quite an achievement and the end result you get to wear! Submitted by leecanknit on Sun, 06/08/2008 - 10:23. Any thought to the idea of releasing the pattern? It's a gorgeous top!